Sunbasket provides all the ingredients to prepare a meal. 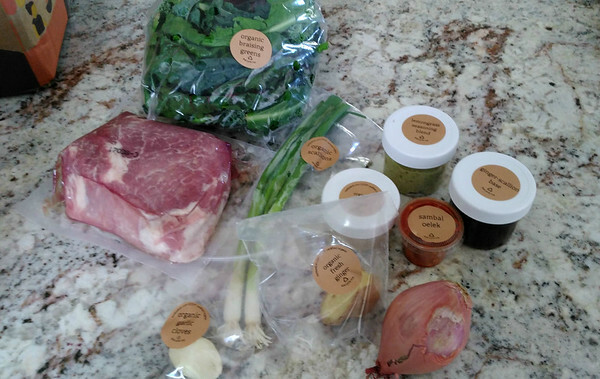 Occasionally, they will throw together a premade marinade, sauce or spice blend to season a dish in order to provide a particular flavor profile. Their lemongrass mix is positively scrumptious. It's a simple blend with lemongrass, olive oil and coriander seeds; but oh, so good! 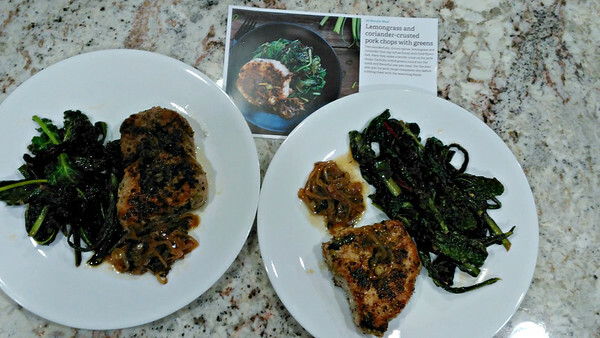 We first tried it with these pork chops, but now, whenever I see a recipe that calls for it, I quickly add it to my order. As you can see from the small collection of items below, this meal came together easily. The shallots and scallions are a breeze to chop. I use a small hand grater for garlic and ginger, since my knife skills are lacking. This was my first time wilting greens and I probably rushed them. They could have used more time, the thicker leafy greens weren't very tender. Lesson learned. Those pork chops, though, I'm eager to see those again in the weekly line up. Tender, juicky and amazing flavor. Yum.